1. 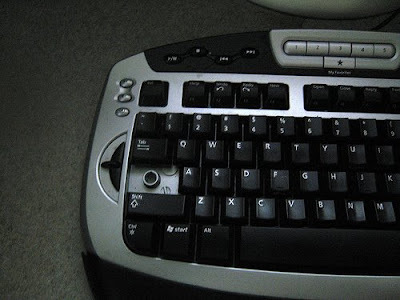 I turned off the caps lock key. 2. I bought a text expansion tool. This is what Mark Hurst calls a "bit lever", and he's the one who introduced me to the idea. 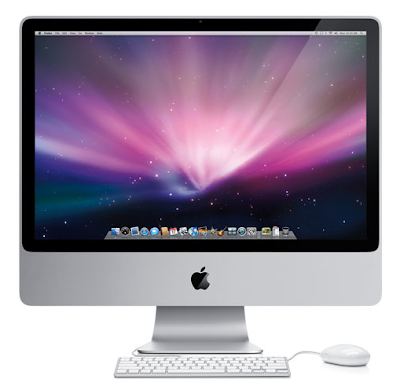 My choice is Typinator (a Mac-only product), but there are plenty of other options for both PCs and Macs; Guy Kawasaki uses TextExpander. Typinator lets me define a whole series of simple abbreviations that I can type in any program. When I enter one of those abbreviations, it gets replaced with a chunk of text - in my case, that's often multiple paragraphs. I use it for long phrases I type with some regularity (such as National Association of Professional Organizers - San Francisco Bay Area Chapter), some standard e-mail replies I send as a Freecycle moderator, and much more. 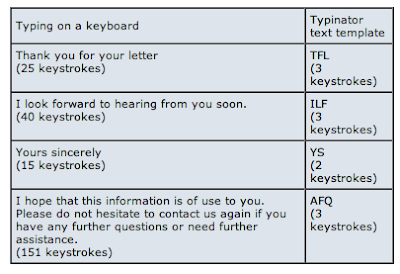 Highly recommended for all - not just the two-finger typists! 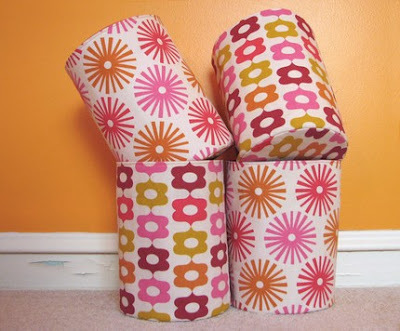 Fabric buckets provide a splash of color and pattern to jazz up any room - and at not-too-crazy prices. This bucket by Lotta Jansdotter costs $32 (plus shipping, and possibly tax) and is the most expensive of the choices listed here. Update on April 15, 2012: Lotta Jansdotter doesn't seem to sell these any more. Other nice buckets are available through various Etsy shops. 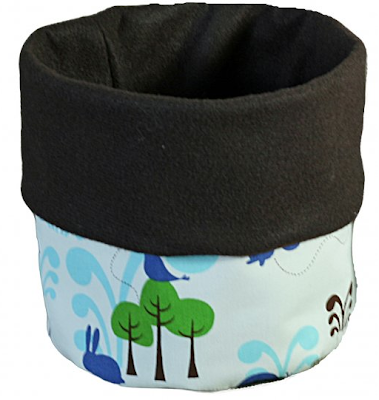 This fabric storage bucket comes from Henry and Zoe; right now, there are nine different fabrics available. 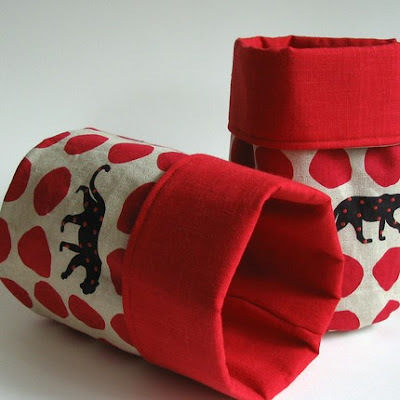 These fabric buckets come from White Rabbit 21; right now, the store has seven different bucket choices. 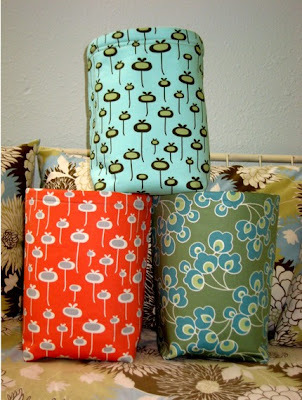 And these fabric buckets come from How About Orange. Update on April 15, 2012: The owner of this Etsy shop is closing it down. 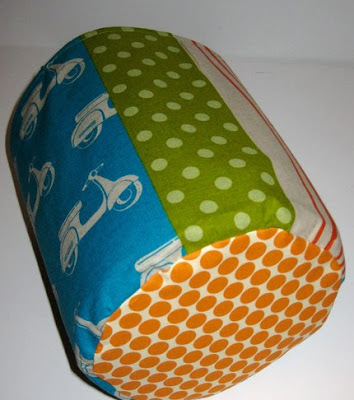 Sewing Momma provides these fabric bins. Update on April 15, 2012: This Etsy store seems to have disappeared. 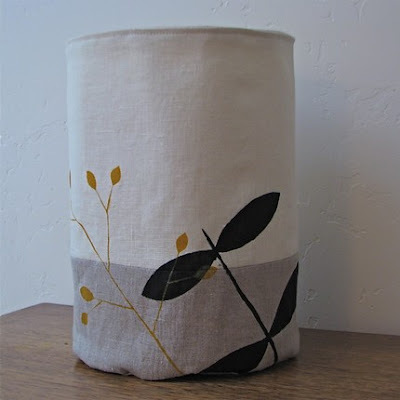 Inklore has this linen bucket. Update on June 5, 2013: These buckets are no longer available; Samantha Hirst, who ran the shop, has refocused on other types of products. 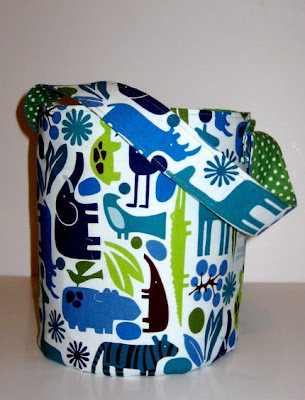 And finally, leaving Etsy, Tiny Décor has felt buckets, made from 100% organic cotton. 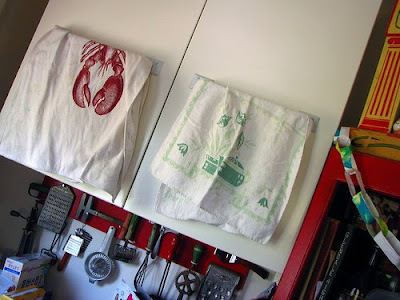 Update on April 15, 2012: This web site disappeared — but seems to have re-appeared on Etsy. 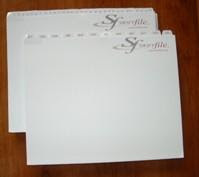 While a tickler file has a file folder (or a slot) for every day of the current month, and for each of the next 12 months, there are other products that just have spaces labeled 1-31. 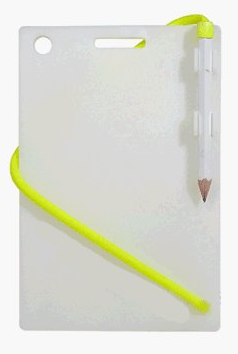 While these are often called bill organizers, you could certainly use them for other things too. 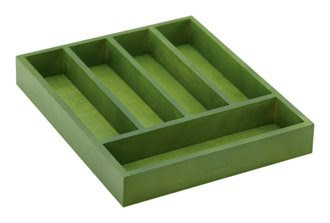 Here's one such product I've seen a lot: the wood 31-day monthly bill organizer. 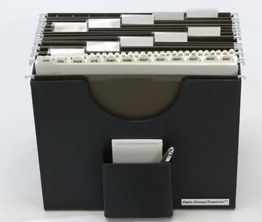 Another option is the rotating bill organizer. [via ADD Consults] Update on Sept. 1, 2014: This product doesn't seem to be available any more. 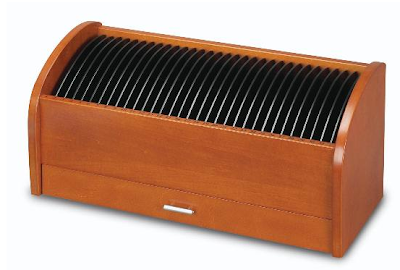 There's also this sorter from Esselte, in red. It's made with 30% post-consumer waste. And a number of companies make expanding files with 31 pockets. 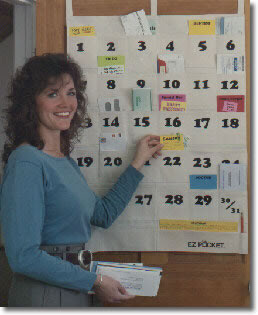 And another option is the EZ Pocket Date Organizer. This one is promoted as more than a bill organizer: "Simply tuck a note, bill, sports ticket or invitation in the dated pocket that corresponds to when the 'action' needs to take place. Every day check the current date's numbered pocket." Update on Nov. 1, 2012: I'm no longer finding this product. This site’s title, 43 folders, refers to the number of manila folders required to build a physical tickler file system. 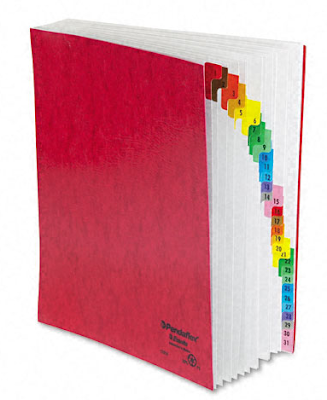 Twelve monthly folders and 31 daily folders are used to build a rotating, one-year “look ahead” system. 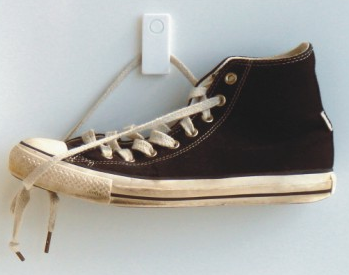 Maintained daily, it’s a powerful lofi hack for never forgetting to do something (and, consequently, not having to worry about forgetting to do something). It beats (or at least complements) your electronic calendar in at least one way by letting you store hard-copy items like cards or bills in the folder associated with any day between now and a year from now. You can also download David Allen's article on the tickler file. Creating a tickler file is easy enough. 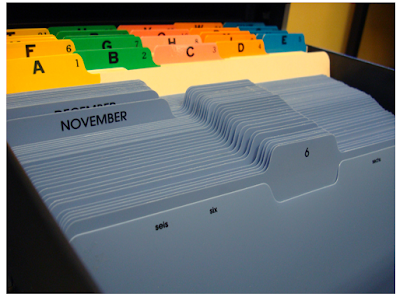 You don't need much: just 43 labeled folders and a place to store them. 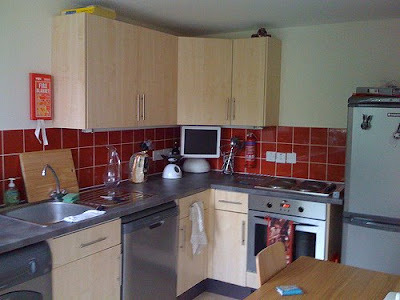 But if you'd like to buy a ready-made system, you can certainly do that. 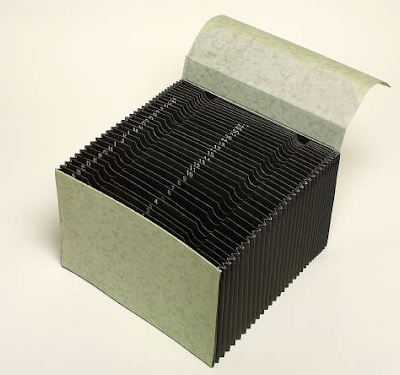 The most common product is the one shown above, from Smead. 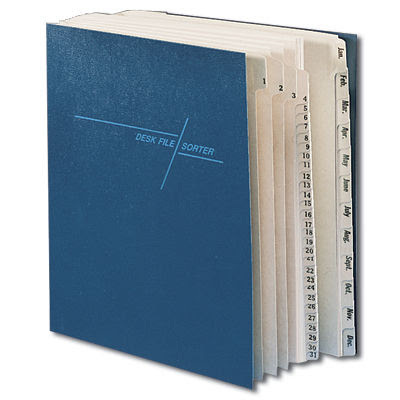 David Allen now sells the GTD tickler file - the 43 file folders (not hanging file folders, since he doesn't like those). The alphabetic files included in this picture are not part of the tickler file product. 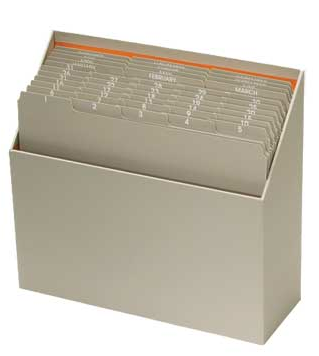 At-A-Glance has this GTD Tools tickler file - the 43 folders plus a desk organizer box. Update on Nov. 20, 2011: It seems this product is no longer available for purchase. 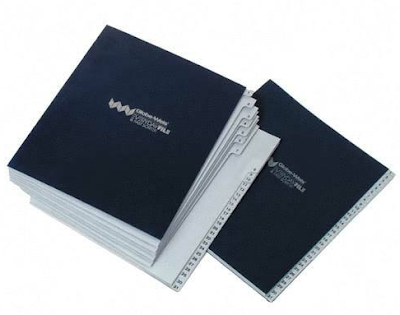 The Paper Tiger Productivity Institute sells the SwiftFile - the 43 folders, sold with or without a desktop file to hold them. 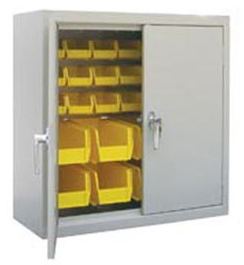 The Alpha-Omega Organizer is a tickler file and more. Thanks to organizer Allison Carter for pointing me to this one. And then there are also some products, often called bill paying systems, that have part of the tickler system - the 31-day portion, without the 12-month portion. I'll cover that in my next post. I'm in the Shower, I Got a Great Idea - Now What? As David Allen tells us: "Your mind is for having ideas, not for holding them." 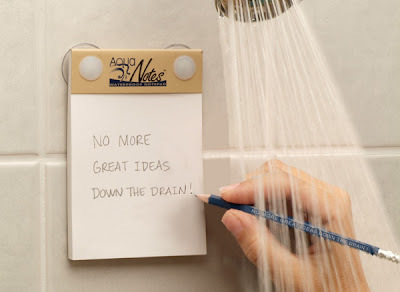 So what do you do about the ideas that come to you in the shower? It's been quite a while since I posted about writing in the shower, so it's time for an update. And the washable crayon is still a decent option, too. 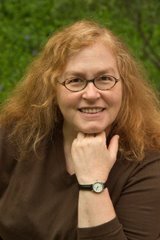 Jennifer Barthe writes on HubSpot, "I too get my best ideas in the shower. I use washable crayons to write down my ideas on the tiles and then I write them down on paper later." 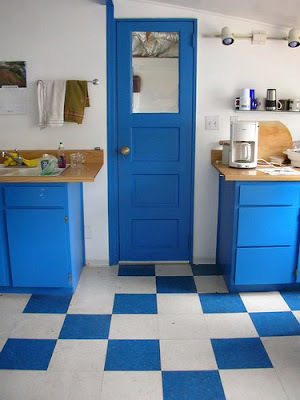 Just be sure the product you're using is not going to cause any staining issues. (Some have reported problems.) 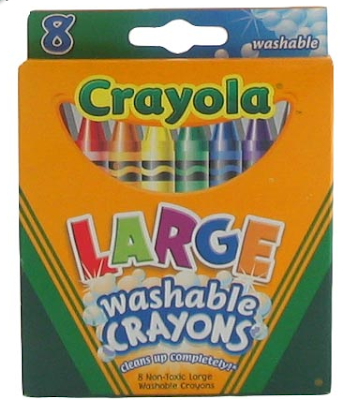 Crayola says, "The Crayola Washable formula was designed to wipe off of most walls and non-porous household surfaces with just warm water and a sponge." 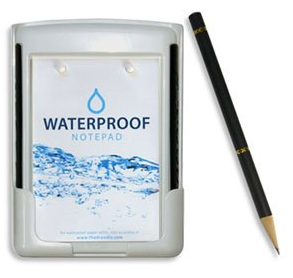 But I'm also intrigued by some newer products, including Aqua Notes - a waterproof notepad. I love my Mac - so I was amused to read some people arguing that Macs are an essential tool for those who care about productivity. Now, for everyone else: buy a Mac. There are two main reasons to make this choice. First Macs are easier to use. The whole point of using a computer is to get things done. Given the choice between getting your work done more or less easily, why would you choose the harder option? This has always puzzled me about people choosing Windows PCs – why would they choose to be less productive? Guy told David, "I don't see how anyone that thinks they are going to get things done uses Windows." And them there's Lauren, who also writes about Moving to Macs for Productivity (and Prettiness). Yes, I'm sure some of you are very productive on your PCs. But I'm just reporting on what I've been reading - and I haven't found people arguing that PCs make you more productive than Macs do. My March 2009 newsletter is now available. Some people use refrigerator door magnets. 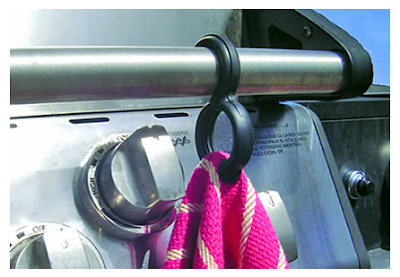 The Endo magnet clip, which I wrote about some time ago, could certainly hold a towel. What other options are there? 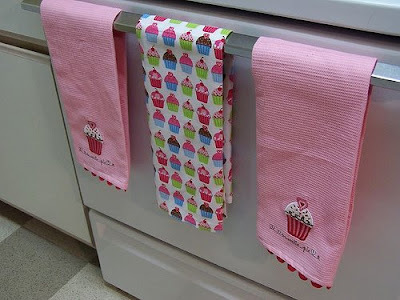 Well, there are the adhesive-backed towel holders (sometimes called towel grabbers). 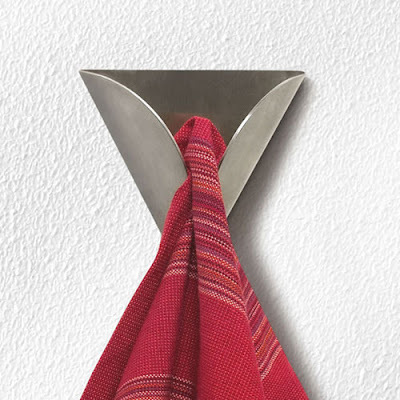 Then there are over-cabinet towel racks. 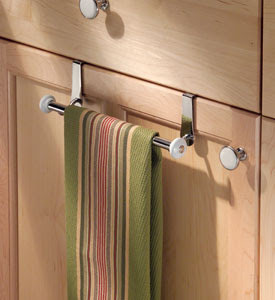 Here's another over-the-door kitchen towel rack, with room for more towels. 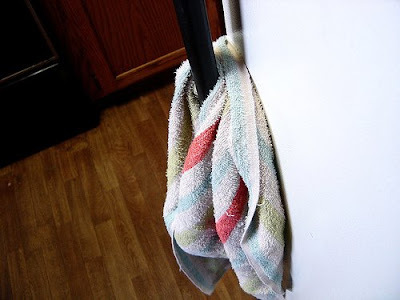 There are over-the-door hooks, too - maybe easier for the towels to fall off (unless you have those crocheted-top towels), but hooks are about the easiest way to hang anything up. 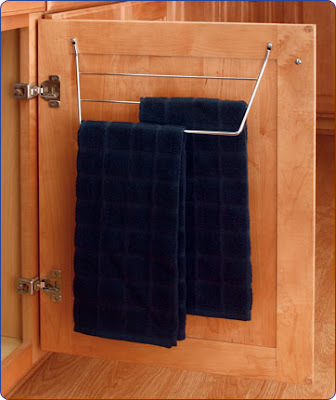 It's not as convenient, but if you like to hide your towels away, you could use an inside-the-door towel rack. 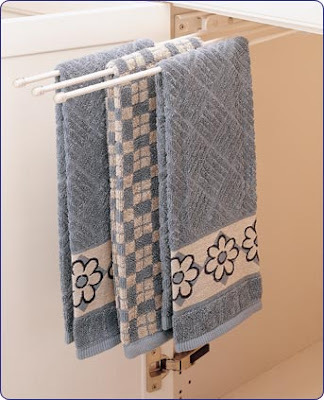 OK, that photo shows bath towels, but you could use it for any towels you wanted. 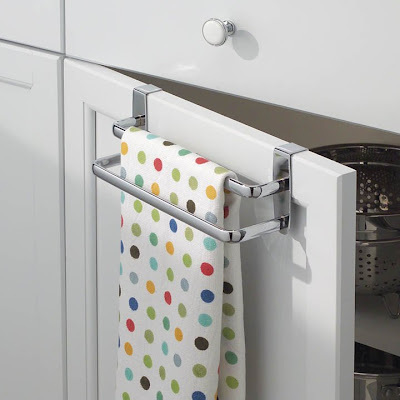 Another inside-the-door option is the pull-out towel rack. 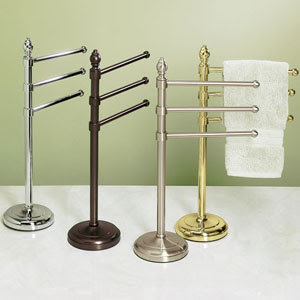 If you had countertop space available, you could use one of the many countertop towel trees that are available. 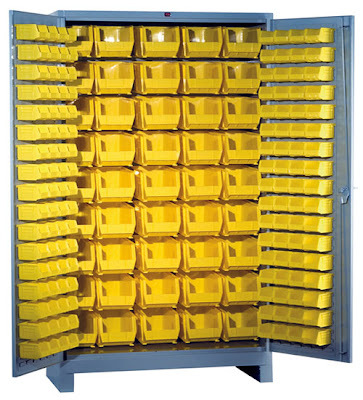 Sometimes a series of bins is the perfect storage solution. 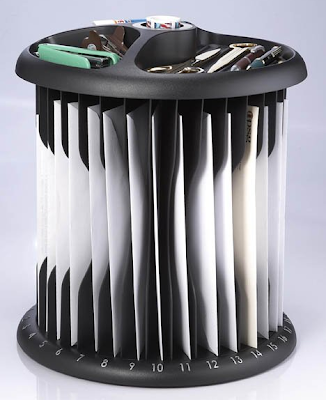 Here are some companies that make bin storage products. 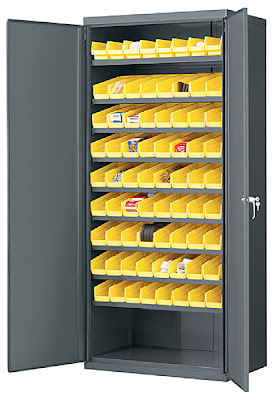 While I'm only showing one product/company, most of them make a range of useful stuff: cabinets, racks/shelving, and carts. 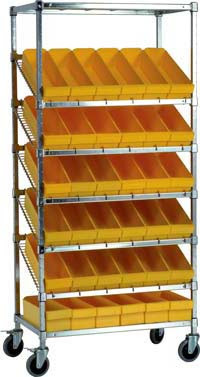 We'll go through in alphabetical order, from A to W.
Flexcon Container makes this cart, and a lot more. 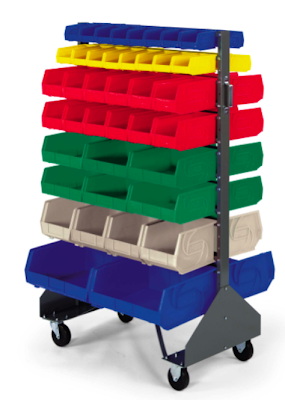 LewisBins is another company with a wide range of products, including this cart. 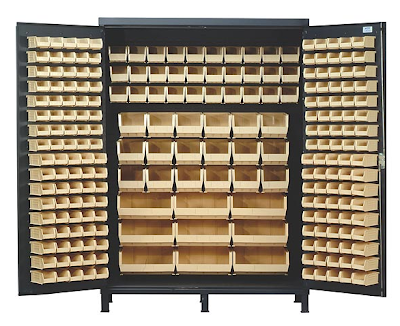 Lyon Cabinets makes just what you'd expect - cabinets. 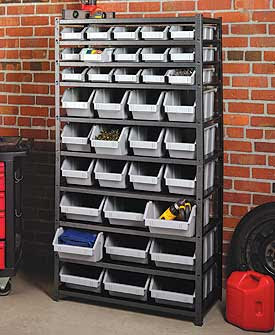 And finally, Whalen Storage has this bin rack with metal shelves.